Peter Tickner, Reading, UK, Director of Peter Tickner Associates Ltd. Peter was the Director of Internal Audit for London’s Metropolitan Police Service (‘Scotland Yard’) between 1995 and 2009. In his early career he was an external auditor for the NHS. Peter was also Head of Internal Audit at Her Majesty’s Treasury between 1988 and 1995. He has held past positions as a Director of the Institute of Internal Auditors (UK and Ireland), Chair of the Editorial Board for the IIA Journal and as a senior lecturer at the Civil Service College. 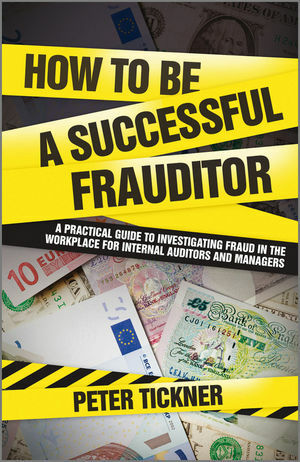 He is a regular speaker and presenter at international antifraud and corruption conferences and through his company provides training and presentations to help organisations deal with fraud and corruption in the workplace. Foreword by Lord Harris of Haringey. PART II PLANNING AND MANAGING. 3 Planning a fraud investigation. 5 Gathering and using intelligence and evidence. 6 Using analysts to support the investigation. 7 Technology that aids fraud investigation. 11 Catching your crooked contractor. 12 The danger that is a Trojan fraudster. 13 Dealing with high-volume, low-value frauds. 14 Pay and pension frauds. PART V GETTING THE RIGHT RESULT. 15 Dealing with the law. 16 Dos and don’ts of preparing for civil litigation. PART VI FRAUD IN CONTEXT. 18 So, now you’re a fraud-finder too? 20 Conclusions and way forward. A Are you a fraudfinder? C Fraud risk wheel (the ‘wheel of misfortune’). E Summary of modules in the CIPFA Certificate in Investigative Practice. F Formulae and table to assist advanced techniques. G Detecting abuse in credit card transactions by Richard Kusnierz.